This review will outline what I like and what I feel could be improved with the Ronhill Stride Windspeed Jacket. I have also photos of where in the world I have worn this jacket. I have been wearing various iterations and colours of this particular jacket for 3 to 4 years. I have easily run hundreds if not thousands of kilometres in this jacket and am very well acquainted with it. The jacket is made of a lightweight material that is quite breathable. There is a small zippered pocket on the upper left hand side. The blue/grey jacket shown below has two reflective stripes on the front and one reflective stripe on the back. Previous versions of this jacket, like the lime green one that I have, also had one reflective stripe on the outside of each wrist. The reflective stripes are nice to have because at least half of my run commutes are in the dark and this helps motorists see me better. Regarding visibility, there is a small black circular rubber disk in the central back area (see photo above right) that stays secured in place inside a circular metal grommet. This black disk can be replaced by a red light disk that is the same size, and blinks. The exact same disk is found on the Ronhill backpacks such as the Ronhill Commuter Xero 10L + 5L vest backpack, which I wrote a review about here. A feature that I really like is the soft black fabric around the neck area and also a strip of soft black fabric in your chin/front of neck area. I have never had any issues with chafing at all in this jacket. It is really comfortable. There is also a little hoop of fabric in the back that is used to hang up the jacket. The zipper on this jacket works exceptionally well. There have never been any issues with snagging or catching the zipper in fabric. I typically start my run commute wearing this jacket and then take it off (while running) once I warm up after about 10 minutes. As shown in the photo below, there is a narrow strip of black material just behind the zipper, which helps to make the zipper slide very easily. The strip of material behind the zipper also prevents drafts from getting through. The zipper pulls are nice and small (but still large enough to use even with running mitts on). They snap down in place and do not flip/flop up and down when you run, which is great. The wrists are simple and effective. A section of the wrist is elasticized and I find the wrist opening to be perfect even while wearing a GPS watch or while wearing thicker fleece running mitts in the winter. The wrist material is cut in a way so that the outside of the wrist is slightly longer than the inside of the wrist. The back of the jacket is longer than the front of the jacket. The blue/grey jacket shown below has elasticized sections on each side of the waist. Previous versions of this jacket had a thin bungee cord that ran along the inside bottom perimeter of the jacket. The black rubber disk is shown in the back centre. Simplicity of Design - It is a really good, simple, functional design that has undergone minimal change, which I like. Lightweight - it packs up really small and is so lightweight that I can carry it in one hand even for long runs of 30 km or more. Breathable - the material is wind resistant and water resistant, which to me is preferable over a jacket that is waterproof and therefore less breathable. There is one zippered pocket in this jacket. The nice thing about this pocket being zippered is that you can pack the jacket up into this pocket and then zipper it shut. You can also put a map, keys, credit card, gels, etc in this pocket and nothing will fall out. The upper end of the zipper has a sheath of fabric that covers the zipper pull (see photo below). This sheath prevents water from entering the pocket when the pocket is zippered up and it is raining. There is also a fabric sheath on the bottom of the pocket but the length of this fabric sheath is too long. As shown in the photo below, the zipper pull is completely submerged beneath the fabric sheath. When this happens, it is a little annoying to fish the zipper pull out with your fingers. I suggest that the zipper sheath on the bottom of the pocket be shortened. The photo below shows the Ronhill Stride Windspeed jackets that I own from oldest on the left (lime green) to newest on the right (lighter blue). As you can see, the black circular rubber disk in the back centre of the jacket has gradually moved up as the various iterations of this jacket have been released. The oldest version is the lime green one on the left and the newest version is the light blue/turquoise one on the far right. I personally feel that this was not a good decision and there are two reasons. First, while sitting/driving in my car before and after a run while wearing this jacket, the black disk is uncomfortable when I lean back into the seat because it gets right in between my spine and the car’s seat. When the black disk was lower down on the back like in the lime green jacket, the disk would fit in the “small of my back” and I would not notice it while driving. When the black disk is removed, the discomfort goes away. Secondly, when I am wearing my Ronhill Commuter Xero 10L + 5L vest pack on the run commute to and from work everyday, the black disk is right in between my spine and the Ronhill backpack, making it uncomfortable. In addition, the black disk is so high in the lighter blue jacket that the backpack covers up the disk. If I did have a red blinking light in place of the black disk, the light would be completely obscured by my Ronhill backpack. In terms of the reflective stripes, I like that the newer jackets (lighter blue, on the right) have a reflective stripe in the lower back of the jacket. This location makes the reflective stripe still visible while wearing a Ronhill backpack. The reflective stripes on the older lime green and darker blue jackets were obscured when wearing a backpack. The older lime green jacket had reflective stripes on the outside of each wrist. I liked the location of these stripes because it made me more visible to motorists from the side (laterally). The wrist reflective stripes are no longer on the newer darker blue and lighter blue jackets. Philadelphia Half Marathon in Nov 2017 - you might recognize that arched bridge because it was in one of the Rocky movies. This was just before the Hams and Hamstrings 5k at 7,000 feet ASL in Colorado Springs in Apr 2017. It is the perfect warm-up jacket. I placed 2nd in that race. 1st place was local resident (and world mountain running 2016 champion), Joe Gray. Running above 14,000 feet ASL. This was what I brought on my way up Masala Peak, the highest peak in Bulgaria. I ran up this peak after the World Mountain Running Championships in 2016. This was when my wife, Emily and I ran across Cold Lake and back in January. For a post about it, click here. The lake is massive; about 25km across and nearly 100m deep. On my daily run commute to and from work all year around. It was more than a little cold. I believe the temperature was around -30C. Cold Lake is farther north than Edmonton and it gets noticeably colder there. At the National Altitude Training Centre. 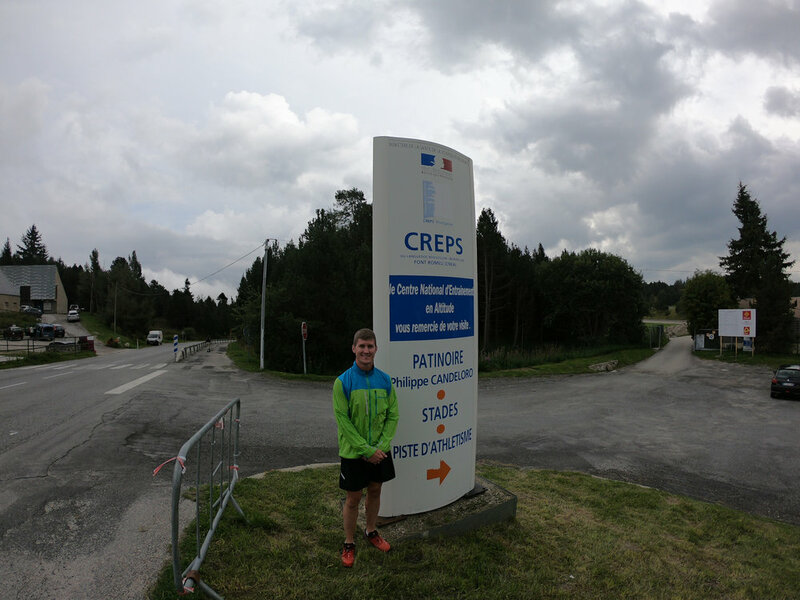 Font Romeu feels a lot like Flagstaff, Arizona, USA. Overall, the Ronhill Stride Windspeed Jacket is the best running jacket I have ever worn in my life. I have worn various versions of this jacket for thousands of kilometres and am very impressed with it. If you have any questions or would like more information about it, please feel free to contact me via the “Contact” link at the top right of this page. This post will outline my personal impressions of the Nike Vaporfly 4% Flyknit racing flat. It will begin with how I acquired two pairs of them, then show photos of the shoes from various angles and finally compare these shoes to other Nike shoes that I have worn. I have worn these shoes a total of 56.5 km so far; broken down as three easy runs and one Chicago Marathon 2018. Nike claims that these shoes are the fastest running shoes in the world. I am not sure that I agree. At $320 CAD ($250 USD) plus tax per pair, these are by far the most expensive running shoes I have ever worn in my entire life. They are over twice the price of pretty much every racing flat I have worn. Are they twice as good? That is yet to be decided. It all started about six months ago when the original version (photo below) of the Nike Vaporfly 4% came out. I looked for the shoes on practically every website online but could not find a size men’s 10.5 US anywhere. Eventually, I saw that a “friend” on facebook happened to be selling them. This friend claimed to be from Kenya and to be sponsored by Nike. He sent me a number of photos of the shoes and I even signed up for a World Remit account in preparation for transferring him the money. However, there were a number of red flags that came up throughout the whole process and I decided not to carry through with the transaction. I am 99% sure that this person was a scammer and am very glad that I did not send him any money. I was eager to buy a pair of the newest version of the Nike Vaporfly 4% racing flats called the Flyknit as they had previously “dropped” (i.e. were made available for purchase) in Canada on 01 Oct 2018. Unfortunately, on 01 Oct 2018, I received the text notification while I was sleeping at 3 am and by the time I woke up at 6 am, they were all sold out online. I was determined not to make the same mistake twice. Therefore, I stayed up late on Wed 03 Oct 2018 because I had read online that the Vaporfly would drop on 04 Oct 2018. On Wed 03 Oct 2018, while I was in Chicago, I stayed up late waiting for the release of the Nike Vaporfly 4% Flyknit racing flat. I looked at various options of buying them. Should I buy them online or in person? Should I buy one pair or two pairs? Unfortunately, they did not go on sale in the early hours of 04 Oct so I went to sleep. On Thurs 04 Oct 2018, I woke up abruptly at 9:12 am when my mobile phone dinged with an incoming message from Nike to say that the Nike Vaporfly 4% Flyknit had “dropped”. I immediately jumped out of bed, pulling the charging cable out of the wall as I frantically opened my laptop and hit refresh. When I signed in, less than 60 seconds later, Nike.com told me that there were no size 10.5s in stock. How can that be, I asked? I then looked at other websites where the Vaporfly was supposed to be sold: runningwarehouse.com had removed the Vaporfly entirely from their website, Eastbay continued to give me an error when I tried to checkout and various other sites simply did not have any stock remaining. In a last ditch effort, I drove to Fleet Feet Sports in downtown Chicago that day as they said they would be selling them at their store starting at 12 pm on 04 Oct. I arrived at the store at 11:45 am but could not initially find parking. I was so focused on buying these shoes, that I even considered parking in a “no parking” area and taking the chance of either paying for the ensuing ticket or possible tow fees. I thought that I would consider that the “Vaporfly tax”. I arrived at the Fleet Feet store and there were about 20 people lined up outside. The first thing I did was look down at the sizes of other’s feet and make an estimate of how many size 10.5 US shoes they might have left once I got my turn. There was an electric energy in the air and everyone was really friendly and talkative. Strangers became friends. Everyone was really kind and wished “good luck” in the Chicago Marathon to everyone else. They only allowed about 5 people into the store at one time and all of the shoes were stored in a back room. I was surprised when the employee brought out two pairs of 10.5 Vaporflys for me. I felt like I was part of a drug deal or something (not that I would know). Like on the movie Requiem for a Dream when all the drug addicts show up at a grocery store because there is supposed to be a shipment of drugs there. I walked down the street with many hundreds of dollars of USD cash in my pocket as I didn’t want there to be any complications with the transaction. I am glad that I did not get mugged. Because the Vaporfly was so challenging to find anywhere, I did not only buy one pair but I bought two pairs! I even thought about buying five pairs after the Fleet Feet store manager announced that each customer was allowed to buy five pairs max. Thankfully, I did not buy five pairs. I opened the box and was initially impressed with how they looked but my mind was not blown. Considering how much hype there was behind this shoe, I was expecting A LOT more. I picked them up and immediately noticed how stiff the sole was as I bended it back and forth in my hands. The shoes fit true to size. They did, however, fit more snug than training running shoes such as the Nike Pegasus 34 and 35. I tried on a size 11 just to make sure and the size 11 was definitely too loose for me. Considering the exorbitant price of these shoes, I wanted to make sure they were perfect. I did a short 40 minute jog in the shoes just to make sure they felt good, which they did. The very first thing I noticed was how soft and comfortable the foam was. I believe Nike calls this foam the ZoomX foam. The second thing I noticed was the sound they made when they struck the pavement; exactly the same as in the Nike Breaking 2 Commercials. They have quite a high stack height (31mm in the heel and 21mm in the forefoot, I believe) and do feel similar to the Hoka Cliftons. When I ran in the Vaporflys, I felt almost like I was running on stilts (highly exaggerated, but you get the idea). When you look in the mirror, you look taller because of the stack height. The following photos were taken by myself. The shoes that are shown below have a total of 56.5 km on them. The tongue is integrated into the upper. When you slide these shoes on, it feels like you’re sliding your foot into a sock. The flyknit upper is quite stretchy and breathable. The forefoot/toe box felt quite snug the very first time I tried them on and it didn’t seem to change at all even after I wore them for 50+ km. It feels like you are wearing a sock. I think the flyknit material was a smart marketing decision by Nike because of how stretchy it is, it accommodates a large breath of different forefoot widths, which means more people will purchase the shoe after trying them on in the store (compared to a shoe, like the original Vaporfly 4% or Zoom Fly that has a non-stretchy upper material). Another thing that I do not like about the Vaporfly Flyknit is that the sole gets crinkles/creases, which make it look much more used than it actually is. This is a pretty minor thing for me. Durability seems okay so far. In any effort to save weight, I believe that Nike has put minimal black rubber on the outsole. Although it is good that the shoe is lighter, the white foam is not nearly as durable as the black rubber as you can see in the photo below. The photo below shows a few other Nike running shoes that I wear. The two on the left are training shoes and the two on the right are racing flats. From left to right, Nike Pegasus 35, Nike Pegasus 34, Nike Zoom Fly (the predecessor to the Nike Zoom Flyknit that came out in 2018) and the Nike Vaporfly 4% Flyknit. Weight - I weighed all of these shoes myself. They are all men’s size 10.5 US and the weight for each pair of shoes (i.e. one left shoe and one right shoe) are as follows: Pegasus 35 is 572g, Pegasus 34 is 600g, Zoom Fly is 510g and Vaporfly Flyknit is 416g. The photo below clearly illustrates how much narrower the mid-foot of the Vaporfly Flyknit is compared to other shoes. 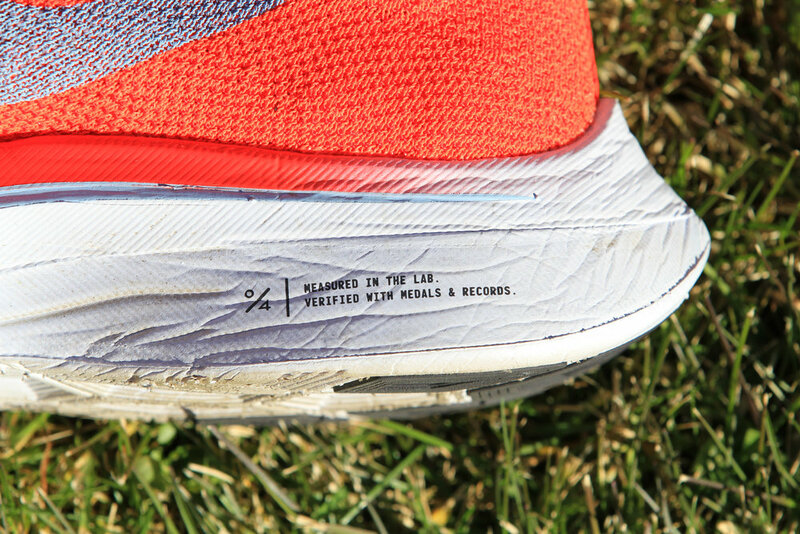 You can also see that the amount of grip/tread on the forefoot of the Vaporfly is much less than the amount of grip/tread on the Zoom Fly. Width of Mid-Foot - One of the biggest differences between the Zoom Fly (left) and Vaporfly Flyknit (right) is the width of the mid-foot. At the narrowest point, the Zoom Fly’s mid-foot is 69mm while the Vaporfly Flyknit’s mid-foot is 56mm. That is a difference of 13mm (1.3cm) or in other words the Vaporfly is 19% narrower in the mid-foot, which is a big difference! The mid-foot of the Vaporfly Flyknits is the narrowest midfoot of any shoe I have ever worn (and I have probably run at least 30,000 km). One of the first things I noticed when I tried them on was that the inside of my feet (in the mid-foot area) seemed to hang in space off the inside of the shoe; there is no foam beneath the inside of the mid-foot. I personally do not like this. I believe that in an effort to save weight, Nike has trimmed away the foam that would normally be in the inside mid-foot area. 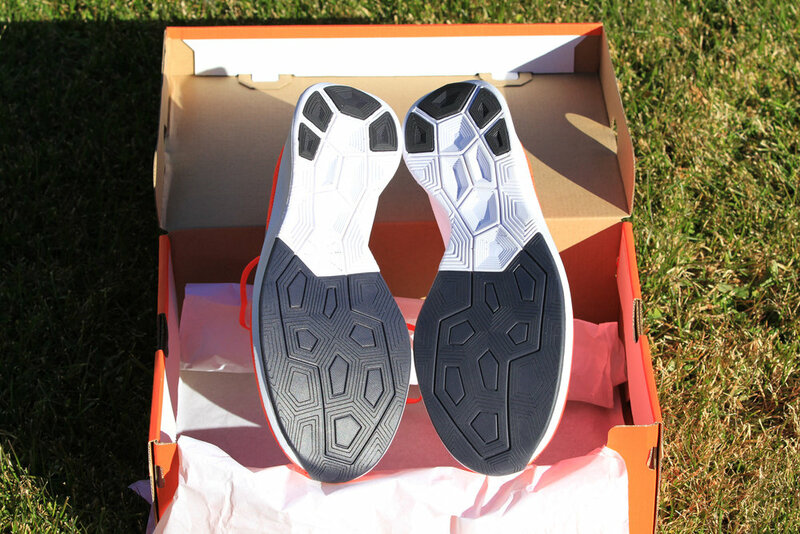 In addition to foam weight savings, Nike is also able to save weight (and cost) on the carbon fibre plate that is in the soles of these shoes. Width of Heel - The width of the Zoom Fly heel is 87mm while the width of the Vaporfly Flyknit heel is 82mm. The difference is 5mm as can be seen in the photo below. Weight - For men’s size 10.5 US, I personally weighed the Zoom Flys to be 510g and the Vaporfly Flyknits to be 416g. That is a difference of 94g per pair. Some of my other racing flats are the Brooks Hyperion (390g per pair), the New Balance 1400V5 (438g per pair) and the Brooks T7 (414g per pair). In terms of weight, the Vaporfly Flyknits are around the same weight as some of my other favourite racing flats. Stiffness - The Vaporfly Flyknit is the by far, the stiffest shoe I have ever worn. This takes a little getting used to. The shoes do seem to give you a pop on every foot strike. I am impressed that even though the shoe is really stiff, my heel does not lift out of the heel cup at all while running. The Vaporflys will likely make you faster mainly because of the fact that you THINK they will make you faster. I am sure the technology in the shoe will actually make you run faster but 4% faster is quite a lot. In my opinion, the majority of the 4% gain comes from you thinking you will run faster. You think that you have an edge when you line up on the start line against competitors who do not have the shoes (and the runners without the Vaporflys are likely thinking, in the back of their mind, that you have an advantage that they do not). Nike has done a brilliant job with the marketing of the Vaporfly. What Nike has done reminds me a lot of a story that I read when I was in elementary school. The story went something like this. A group of elementary school athletes were about to compete in the national track and field championships. They were all very nervous considering the level of competition. Before the day kicked off, the young athletic team were called together for a meeting with their head coach. The coach, who was very intelligent and had worked as a professional chemical engineer in a previous career, had with him a couple bottles of a clear unknown liquid. The coach told the athletes that he had been working on this liquid for years and that it had been proven to improve athletic performances in all events. It was simply spread onto the muscles and it would work. The athletes trusted their coach and so they genuinely believed that this liquid applied to their muscles would certainly improve their performances. All the athletes the liquid before competing and sure enough, the runners ran personal best times and the jumpers jumped higher than they had ever jumped before. This clear liquid was amazing; everyone who used it was setting new personal bests. It was not until the competition was over that the students were again called together. The coach explained that what he had given the athletes to spread on their muscles was simply baby oil, no special potion or scientifically proven magic gel. The athletes had performed because in their minds, they felt like they had a technologically advantage over the other athletes and that helped push themselves harder than ever before. Remember that whether you think you can or think you can’t, you’re probably right. I wore these racing flats for the Chicago Marathon on 07 Oct 2018. It was raining and the road was wet for the entire race. When I lined up at the front of the start line, pretty much “everyone and their dog” was wearing a brand new pair of these shoes. Nike deliberately released these shoes just a few short days before Chicago Marathon, one of the biggest marathons on earth. Lack of Grip - The grip/tread on these shoes is not great for wet roads and very poor when you are running on the painted sections of roads (such as white painted crosswalks and centrelines). When I ran on the paint (the was wet from rain), the shoes slipped backwards. I reverted to running in between the painted lines. “Suction Cup” Issue - Another issue I had while running in rain in these shoes was that they had a tendency to “suction cup” onto the road (for heel strikers). Based on the cutout sections in the sole beneath the heel, when your heel strikes the ground, the soft sole squashes outwards, then when your heel lifts back off the wet pavement, you feel a suction under your heel. Kind of hard to explain; it is something you have to experience for yourself. Stiffness - These shoes are very stiff and if you’re not used to it, then I think you might possibly end up using different muscle groups. Fit - The forefoot of the Flyknit is quite snug and fairly narrow; more narrow than the Nike Zoom Fly. When I ran the marathon in the Flyknit, I got pretty major blisters down the centreline of each of my feet between the ball of my foot and the outside edge of my forefoot. It looked like my foot skin had folded over down the centreline. Rounding Turns - When I ran around a 90 degree turn in these shoes, I felt like there was very little support for the ankle and that my foot was almost going to flop over on the side. I felt like I need to be very conservative on the turns because the upper is not very supportive and because the stack height is so high. Brand New - If you would like to purchase a pair of size 10.5s, I have a brand new pair available. They are brand new and have never been used. They are in the original packaging. Located in Alberta, Canada. Willing to ship anywhere in Canada. Please see photos below. Second Hand - If you would like to buy a lightly used pair of size 10.5s, they are also available. They have been worn for 56.5 km and are still in excellent condition. The photos at the start of this review show the condition of the second hand shoes. Update: as of 15 Jan 2019, the used pair of Vaporflys are no longer available. Overall, I am impressed with the Nike Vaporfly 4% Flyknit racing flats. I like that they are fairly lightweight, I like the bounce/pop that I get from the carbon fibre plate in the sole (and possibly because of the ZoomX foam as well). They are very comfortable if they fit your foot. The biggest issue I have with these shoes is that the forefoot is a little too narrow for my foot. I have never had any issues with the Zoom Fly forefoot width (but the longest I raced in those was only 21.1 km rather than 42.2 km). I am also not a fan of the exorbitant price tag of $320 CAD ($250 USD) per pair, which is over twice the price of nearly every other racing flat I have worn in my life. 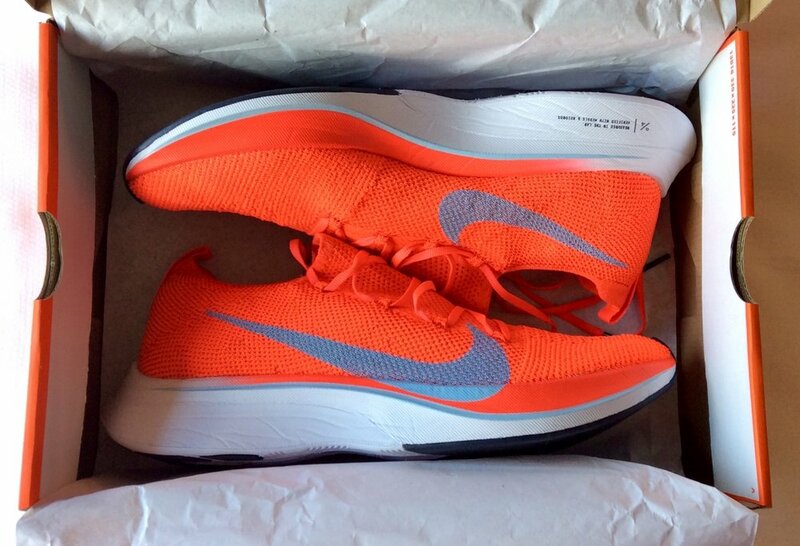 If you are looking for a pair of Nike Vaporfly 4% Flyknit racing flats in size 10.5 US, please contact me using the “Contact” link at the top of this page. If you have any questions or would like me to expand on any particular area of the shoe, please let me know. This review will cover my thoughts on the Ronhill Infinity Merino L/S (long sleeve) 1/2 Zip Tee. This Ronhill top is hands down the best long sleeve running top I have ever worn. I have been running in this top for about 1.5 years, mostly while running outdoors in the winter and while running/climbing in the Canadian Rocky mountains in the summer. The top is made of merino wool and is very lightweight yet warm at the same time. The merino wool is very soft and comfortable and does not make your skin itch. I typically use it as a base layer and even wear it by itself sometimes. Please note that this top may be discontinued but I believe that you can still purchase it online from various websites such as amazon. The two photos below are of the top after wearing it for about a year. It has held up incredibly well and shows very little signs of wear. Note that the thread stitching is different in the top below compared to the top above (from the Ronhill website). The 1/2 zip is a nice touch because it allows you to unzip if you are getting a little too warm and also allows you to easily put the top on even while wearing a helmet or ball cap. The zipper pull is small/unobtrusive and flicks/locks down so that it does not bounce around while you are running. I wear a size medium and the neck is the perfect snugness around my neck when fully zipped up. I believe my neck circumference is around 15" to 16". There is a small triangle of fabric at the very top of the zipper that covers up the zipper. This also ensures that your lips/face do not stick to the metal zipper. There is a long tab of fabric between the back of the zipper and your skin, which prevents wind from blowing through the zipper and also makes it very comfortable (there is not rubbing or chaffing). I wore this Ronhill top a lot while running in Washington State. The tuque (beanie) I am wearing in the photos is also made of the same merino wool material. There is a reflective triangle on the upper back, which allows you to be a little more visible to motorists. The multi-coloured stitching reminds me of the crayon art (scratch art) that I used to do as a child. I would first use wax crayons to draw vibrant colours on a page, cover it all up with black paint and then scratch part of the black paint away to reveal the vibrant colours beneath. The photo below is an example of scratch art. The BASELAYER THERMO-SYSTEM logo on one arm is reflective. The quality of construction of the Ronhill top is exceptional. There is not a stitch out of place even after wearing it for about 1.5 years. There are little thumb holes in each of the wrists. This is a nice touch. You can see in the photo below the high level of craftsmanship that went into making this top. The backing of the Ronhill logo has been carefully trimmed away. This is the typical high quality that you can expect from Ronhill products. A size medium in the Ronhill Infinity Merino L/S 1/2 Zip Tee weighs only 183g. The Ronhill Infinity Merino L/S 1/2 Zip Tee is the first top I bring whenever I am planning a climbing trip to the mountains. This is my friend, Scott (left in photo below) and I (right in photo below) before heading up past the Abbot Pass Hut (the oldest Alpine Club of Canada Hut, built in 1922, in the Canadian Rockies). We then continued to climb the South Summit of Mount Victoria. I also wore this top while skiing/climbing up Mount Columbia on the Columbia Glacier with my friend Josh. I wore it for three days straight (I even slept in it) and it was a perfect base layer. The nice thing about the lightweight fabric was that when we were skiing on the glacier during the day, the ambient temperature was quite warm (esp. with the sun reflecting up from the snow) but the merino wool material dried very quickly and did not make me overheat. The long sleeves were nice to have to prevent my arms from getting burned from the sun. I wore this Ronhill top while running in Washington State, USA during one of the biggest snowstorms they have had in recent years (photo below). I also wore this top while run commuting to and from work everyday in Cold Lake, Alberta, Canada. I hope you have found these photos and brief commentary on the Ronhill Infinity Merino L/S 1/2 Zip Tee useful. This top is extremely high quality, warm, lightweight, it dries fast and I think the fit is perfect for me. This is the best running top I have ever worn and I highly recommend it. This review will focus on what I like about the Ronhill Infinity Torrent jacket and what I feel could be improved. I have included as many photos as possible in this review (taken by myself) as I feel a photo is worth a thousand words. For an overall description, please visit the www.ronhill.com website by clicking the photo below. 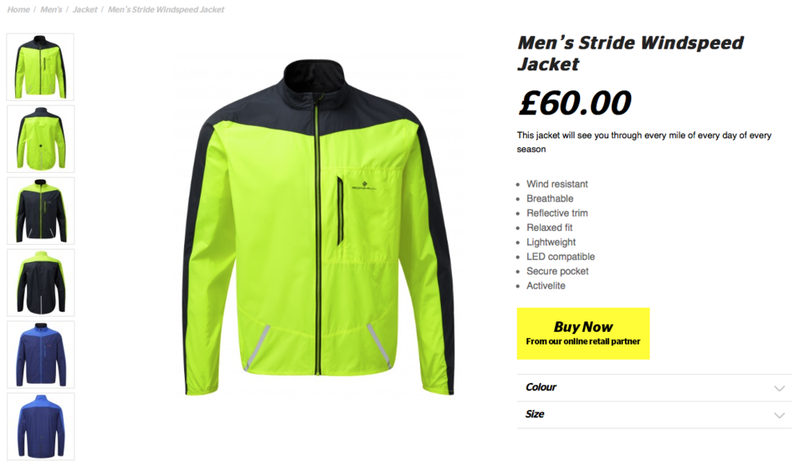 Note that the current colour (charcoal/fluo yellow) is different than the jacket that I have (blue and red) This review will focus on my person observations after running in this jacket for 3-4 months. The very first thing I thought about when I pulled this jacket out of the package was how incredibly lightweight it is. I measured it to be 195g, which is even lighter than the Ronhill Momentum Victory Hoodie. I really like the vibrant blue and red colour of this jacket and I love the simple, elegant and functional design. To me, excellent design is when there is nothing left to remove but the garment still fulfills everything that it was designed for. Simple is good. Simple means lightweight. Simple means easy to use because there is no complicated mechanisms. 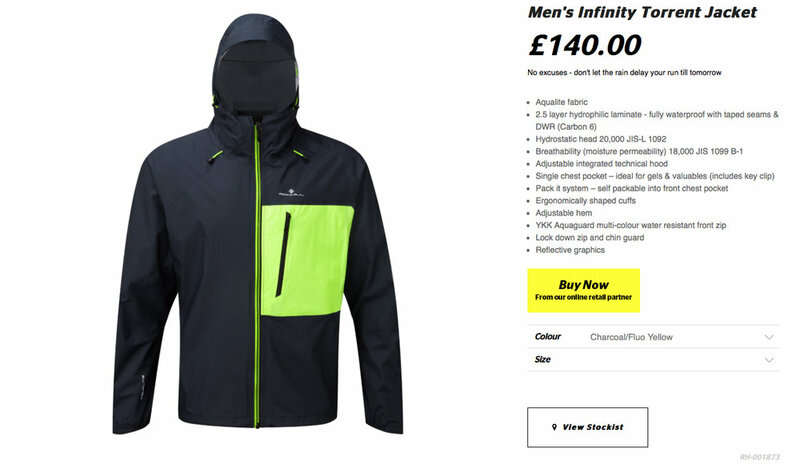 The fit of the Ronhill Infinity Torrent jacket is a little bit looser in the torso than the Ronhill Windlite jacket. The length of the arms feels the same. I wear a size medium in this jacket and the sizing is consistent with other Ronhill garments I have worn in size medium. The zipper works really well and seems very durable. There is a flap of material behind the zipper which eliminates the possibility that wind (or rain) will blow through the front of the jacket. The zipper itself is also waterproof so you have two layers of protection. I really like how Ronhill has printed "#RunEveryDay" on the inside of centre back of the jacket. This is a great reminder for me and also shows that Ronhill is with the times. One each side at the bottom of the jacket are places where you can tightened up the waist cinch bungee cord with one hand. They are easy and intuitive to use. As you can see in all of these photos that I took, the level of care that was put into manufacturing this jacket is very impressive. It is very high quality and there is not a stitch out of place. The size of the hood is perfect for me and there are also two different adjustments that you can make. One adjustment is done via two red bungee cords in the front of the jacket. These two cords cinch down the front opening of the hood (where you look out of). The second adjustment is via a red cord loop on the back of the head. By pulling this red cord loop, the hood beak is brought closer over the top of your head (similar action to tightening up the back of a baseball cap). They work really well and make running with the hood up very comfortable. When you don't have the hood over your head, you can easily cinch it up by putting a flap of material over the bunched up hood, which will prevent the hood from flapping up and down as you run. Ronhill has done a phenomenal job of making this "hood strap down system" exceptionally intuitive to use (really well done, Ronhill!). The very first time I wore this jacket in the rain, I wanted to strap down the hood. Somehow, without ever seeing the system, I managed to figure the system out within seconds while running and not even being able to see what I was doing because everything was going on behind my neck! Incredible! All you have to do is roll or bunch up the hood behind your neck, then open the fabric "strap/trapezoid" (as shown in photo below). Take the black rectangle of velcro on the bottom of the trapezoid and stick it to the blue rectangle of velcro on the outside back of the jacket. That's it! It works perfectly, is very secure and lightweight. Really nice touch by Ronhill. When you zip the front zipper all the way up to the top, there is a nice soft black cloth material that your face/mouth can rub against, if necessary. This is really comfortable. My face does not rub against the jacket at all when it is zipped all the way up. I like the simplicity of the cuffs. There's nothing complicated about them. I like that only half the cuff is elasticized, which allows you to easily pull the cuff over your GPS watch to start/stop/check the time and/or pace. Aqualite is the material used to manufacture the jacket. The tags that come with the jacket reads, "Key benefits: Total waterproof and windproof barrier" and I would agree. It packs up to about the size of a water bottle, which is a bit larger than the packed up Ronhill Windlite jacket. It is very easy and convenient to carry if you want to take it off while running if it stops raining. The weight is only 195g as well, which is less than half a pound. As it is now, one red cord on the left and one red cord on the right hang out the front side of the jacket (see photo below). When you are running, they have a tendency to bounce/faff/jostle about, which I find a little annoying. It would be much nicer if these red bungee cords were routed INSIDE the front of the jacket rather than OUTSIDE the front of the jacket. If you make a jacket that is waterproof/water resistant, then it will not be very breathable (i.e. allows water vapour to escape from the inside). If you make a jacket that is very breathable, then it will not be waterproof/wear resistant. PERIOD. A lot of companies have tried and they claim that they have manufactured a jacket that is BOTH waterproof AND breathable but I have not worn any jackets yet that do both of these things extremely well. It is not a fault of Ronhill (or any other clothing manufacturing company for that matter), it is simply a characteristic of the material. It is kind of like using all season tires all year around rather than summer tires in the summer and winter tires in the winter. The all season tires will work okay all year around but will not be particularly good or bad in any season. However, to be fair, Ronhill has done a better job than any other company I know in creating a jacket that is waterproof while being fairly breathable. A possible solution to this issue could be to maybe add arm-pit zips (although this would add weight) to the jacket. And if you're wearing a jacket in the rain, then you would not want openings in the arm pits for rain to come in and get you wet. Perhaps a small panel material that is thinner and breathable could be placed in the arm pit area. I personally prefer the small YKK zipper pulls that Ronhill uses on almost all of their other garments; the mini-flip lock kind rather than the long string/cord pulls that this jacket has. The zipper pulls on the Ronhill Infinity Torrent jacket have a tendency to flip up and down when you run and I personally don't really like this. This is a really minor annoyance though. Overall, I am very impressed with the Ronhill Infinity Torrent Jacket. If you do a lot of running in the rain, I would recommend that you consider this jacket. Ronhill products can be purchased at Running Room. This post will focus on my personal thoughts regarding the Brooks Glycerin 14 running shoes. I have worn this shoe for approximately 971 km (600 miles). I was so impressed with the Glycerin 14 that I went out and picked up a second pair of the exact same shoe. 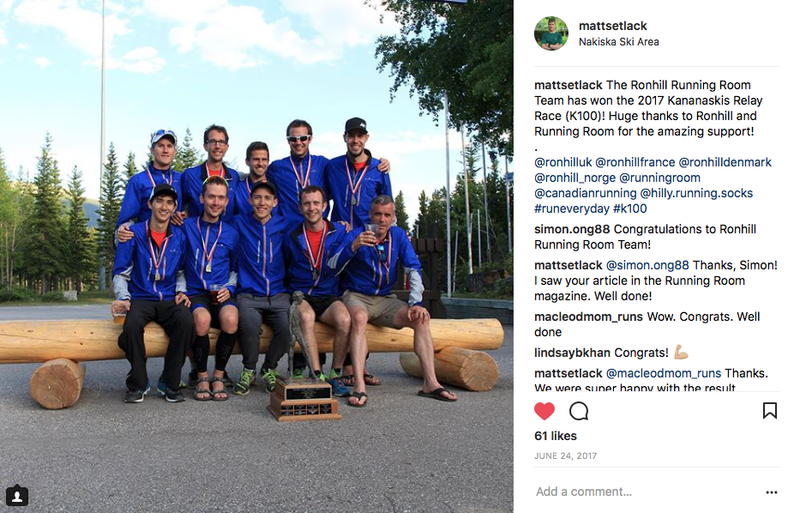 I thought the comparison photos in this post would be useful for runners in general who may be thinking about trying out this shoe. I am not bias towards any one make or model of shoe although lately I have been wearing a lot of Brooks running shoes including the Launch 3, Launch 4, Ghost 9, T5, T6, T7 (amazing racing flat) and Hyperion. For a full list of all the running shoes I wear, check out my Strava page here. Full specs can be found on the Brooks website by clicking here. This is a neutral shoe with medium arch support and a heel to toe offset of 10mm according to the Brooks website although I feel like the offset is more than this. When I'm running in a new pair of Glycerin 14s I feel like I'm running downhill (not a bad thing). Running feels effortless in this shoe. I weighed each shoe to be 325g, which is quite heavy. The following series of photos that I took will show a side by side comparison of my old Brooks Glycerin 14 running shoes with 971 km (600 miles) on them and a brand new, never worn, straight out of the box Brooks Glycerin 14 running shoes. In order to be able to see the wear pattern on the old shoes, I scrubbed the dirt off the shoes. They are not normally this clean. I typically wore the old shoes on asphalt roads 90% of the time and grass trails 10% of the time. "Old" = Glycerin 14 shoes that I have worn for 971 km (600 miles). Photos on left. "New" = Glycerin 14 shoes that are brand new / never been worn. Photos on right. I find the Glycerin 14 very comfortable and cushioned. The forefoot width feels wider than the Launch 3/4 and the Ghost 9. I really notice this when I'm running across a slope (traversing a slope) as my foot has a tendency to slide downhill inside the shoe. This doesn't cause any issues for me. I tie my running shoes once and never tie them again; instead I slip by foot in and out. It saves years off my life especially since I would be tying/untying my shoes 6x per day otherwise. Make sure you use a square knot (aka: reef knot) as this will prevent the laces from coming undone (important). The looser laces also enable good fore-aft ankle articulation and prevents blood circulation to your feet from being cut off. I feel like this shoe is really "rockered"; there is a very smooth transition between the time your heel strikes the ground and you toe off again. The bottom of the shoe feels rounded (kind of like the rounded Sketchers shoes that claimed would make you lose weight). Old on top. New on bottom. The Glycerin 14 is extremely durable; likely the most durable running shoe I have ever worn. Old on left. New on right. The most wear on the Glycerin 14 can be found on the bottom of the soles at the back of the shoe. I would estimate that 1-2mm of black rubber has been worn away from the bottom heal area. There is minimal wear underneath the ball of the foot. Also, the inside cuff area near the ankle has some abrasion (only on old right shoe and not on old left shoe). Old in front. New in back. New in front. Old in back. The moral of the story is that it could be very difficult to tell which shoes are new and which shoes are old. When it comes time to change your running shoes, you should not only look at the physical wear of the shoes but also think about how you feel while wearing the shoes. Personally, I can tell that a shoe is pounded out and ready to be retired when it feels "flat" while running in. I also start to notice aches in my joints. A new version of the Brooks Glycerin has now come out called the Glycerin 15. I have not worn this shoe yet although based on what I have seen with other Brooks shoe iterations (i.e. T5->T6->T7, Launch 3 to Launch 4, etc), I imagine it would be similar to the Glycerin 14. I definitely recommend this shoe for the majority of your training especially long runs. If you're interested in trying on this shoe, check out Running Room. I personally find that the Running Room on 109 Street in Edmonton has the biggest selection of shoes and they also have a back room with many discounted shoes and good prices. The Ronhill Trail Vertex running jacket is designed to keep you warm when running in sub-zero temperatures. It is a very versatile jacket meaning that you can wear it in a wide temperature range just by varying the number of layers you wear underneath. I have been wearing this running jacket for the past month and typically wear it during my run commute to and from work every day (10 mile round trip). So far, I have worn it for approximately 300km in temperatures ranging from -30C to +5C (with varying layers underneath, of course). The Ronhill Trail Vertex running jacket is one of, if not THE, greatest running jacket I have ever worn. The greatest qualities of this jacket is its ability to help you thermoregulate, which I believe is one of the key ingredients of a comfortable jacket. I wore the Ronhill Trail Vertex running jacket in Vancouver, Canada (see photos above) in temperatures around -5C to +5C. Underneath the jacket I wore the Ronhill Merino 200 long sleeve top. It was snowing heavily (those big fluffy snowflakes) and was warm enough that when the snowflakes touched down, they melted (it was a slushy mess to run through). I ran with my wife, Emily for 100 minutes (1:40) and was AMAZED that I was not even a little bit wet (neither from sweating nor from the wet snowflakes on the outside). For those who don’t know, this is revolutionary! Apparel manufacturers have struggled for years to make a jacket that is BOTH water resistant AND breathable but Ronhill has really done it with this jacket. On the exact same 100 minute run, Emily was wearing a different jacket and by the time the run was over, her jacket had completely soaked through and her undershirt was completely drenched...Emily didn’t enjoy the run. I was completely dry and thoroughly enjoyed the run. While I was studying a masters in Aerospace Vehicle Design at Cranfield University in the United Kingdom, one of my professors, Mr. Phill Stocking showed us a quote one day about what good engineering design is. The quote went something along the lines of, “Perfection is achieved not when there is nothing more to add, but when there is nothing left to take away” by French writer Antoine de Saint-Exupery. Whenever I wear Ronhill clothing, I am reminded of this quote as I believe that Ronhill has done a brilliant job at designing and manufacturing running apparel very fit for purpose and not unnecessarily complicated. Although I could be wrong, I get the feeling that Ronhill is constantly designing their products to be the absolute best for the end user. 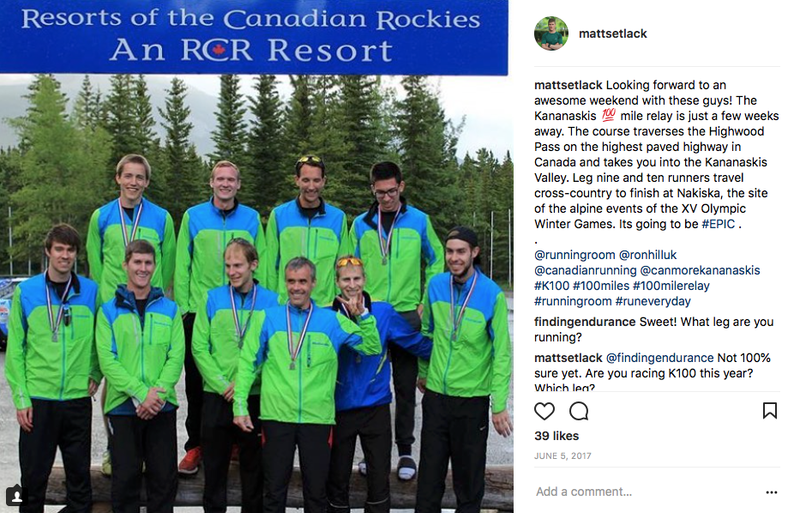 Because of their defined scope of making functional apparel for runners (in addition to backpacks and other running accessories), they do an exceptional job at it. Every Ronhill product that I have worn has been designed and manufactured with the utmost care and it seems that every little detail is well thought out – and works extremely well. Of all the running apparel manufacturers out there, Ronhill, in my opinion makes some of the greatest running apparel that I have ever worn. I find Ronhill products to be more durable, functional, reflective and comfortable than most. If you want quality that will last for years, you should really consider taking a look at Ronhill products. Overall Fit - I wear size medium in Ronhill clothing (except gloves, which I wear large). I think the medium form/model that Ronhill uses for its clothing has my exact shape and dimensions because medium fits me perfectly as if it was custom made. Arm Fit – The length of the jacket arms is a bit longer than typical, in order to allow the runner to stick their thumbs in the wrist thumb holes. I like that the arms are a bit longer as they keep my wrists warm when my arms are bent while running. Another nice thing about the arms is that they are nicely cut to your arms; there is no loose fabric flapping around in the wind. It’s just perfect the amount of material Ronhill left in the arms. The circumference of the wrist feels slightly bigger compared to the Ronhill Wind Lite running jacket that I have been wearing in the summer (it's the bright green and blue jacket that I'm wearing in other blog post photos). This is a good idea because when you’re wearing this jacket you will likely also be wearing mitts or gloves and having a bit of extra room in the wrists helps accommodate the gloves. Torso Fit – The jacket torso length is perfect for me. The circumference of the jacket torso is not restrictive nor too loose so cold air doesn’t come up from below. Versatility - I have worn this jacket in +5 with a thin t-shirt underneath and I have also worn it in -30C with two long sleeve wool tops on underneath. I like to wear this jacket with the Ronhill Merino 200 wool top (fantastic piece). The temperature range for this combo is around -5C to -20C. You can wear it in such a large range of temperatures because the wool top seems to do an amazing job of keeping you warm. Thermoregulation (Temperature Regulation) – You can unzip the front pockets or unzip the front of the coat to cool off or do the opposite to warm up. The PrimaLoft panels in the front and back of the jacket keep you warm but the material in the arms is thinner (no PrimaLoft) so that you don’t sweat. It’s a brilliant design. Material - The material that the jacket is constructed of is stretchy, which, in addition to having a really nice fit, makes it super comfortable. Another advantage of the stretchy material and the particular stitch pattern that Ronhill used is that it allows the runner to easily stretch the jacket wrist cuff over their watch or GPS watch (a really nice touch). Most other jackets I have worn have non-stretchy wrist cuffs and usually what happens when you check your watch while running is that you either accidentally press the buttons because the cuffs are so tight or you don't bother checking your watch because you can't access it. The stretchy wrist cuffs on this Ronhill jacket are one of the things that make this jacket really fit for purpose. Water Resistance - The jacket has a special coating (DWR – Durable Water Repellent) so the rain/wet snow just beads and runs off the jacket, which is really nice. If you're sweating, the DWR coating doesn't prevent the water vapour from leaving the jacket. Lack of Hood – This is a good thing. It makes the jacket lighter and 99% of the time when I'm running, I don’t use a hood anyway. I also find it annoying when a hood is bouncing around behind me and partially filling up with air as I run. 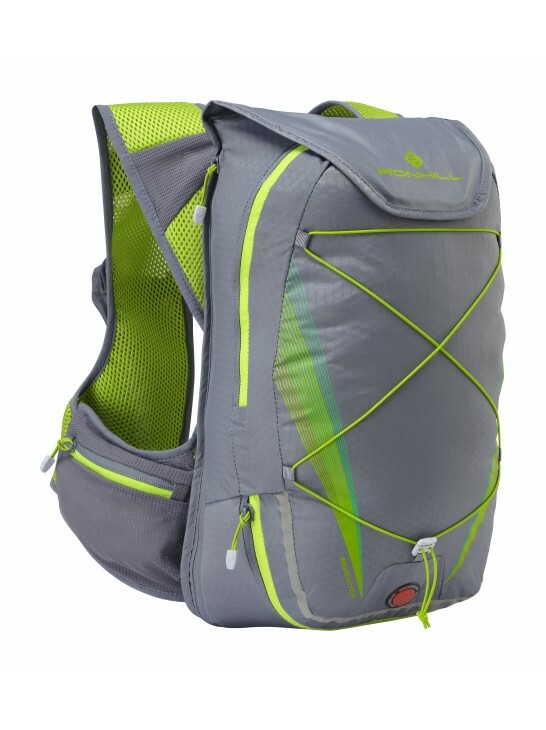 Lightweight (257 grams) - It is light enough and packs up small enough that if you get too warm on the run, you can take it off and easily carry it in one hand while you complete your run. YKK Zippers – They are nice and small but still big enough to use with mitts on. When you flick them down so they are in-line with the zipper, they are locked in place. I like that they don’t flip/flop all over the place when you are running. Behind the main zipper is a wind block strip of material to prevent the wind from blowing through the zipper. Thumb Holes in Arms – Personally, I never really use these thumb holes and I find that when I do, I feel like the design could be refined a little more. Emily likes using thumb holes so I guess it’s just a personal preference. However, these thumb hole do not take anything away from the jacket and do not affect its performance in any way. Reflectors - When I wear this jacket on the run commute in the mornings and evenings, it is usually dark outside. Ronhill could possibly consider putting reflective stripes on the front/back of the jacket. However, there is a currently a reflective Ronhill logo on the front chest and a small reflective triangle on the upper back torso. This is a non-issue when I wear the Ronhill tuque (beanie) because it has a reflective stripe that goes all the way round the head making me visible to passing motorists. I think reflectors on running clothing are a personal preference. The nice thing about not having reflectors is that you can always add reflectors later (via arm bands, reflective belt, etc) but if you buy a jacket with a lot of reflectors already on it, it is near impossible to take them off. I like the reflector scheme that was used on the Ronhill Wind Lite running jacket. The Ronhill Trail Vertex running jacket is very likely the greatest running jacket I have ever worn. Ronhill has nailed the design of this jacket. This is the perfect running jacket for anyone running in sub-zero temperatures. 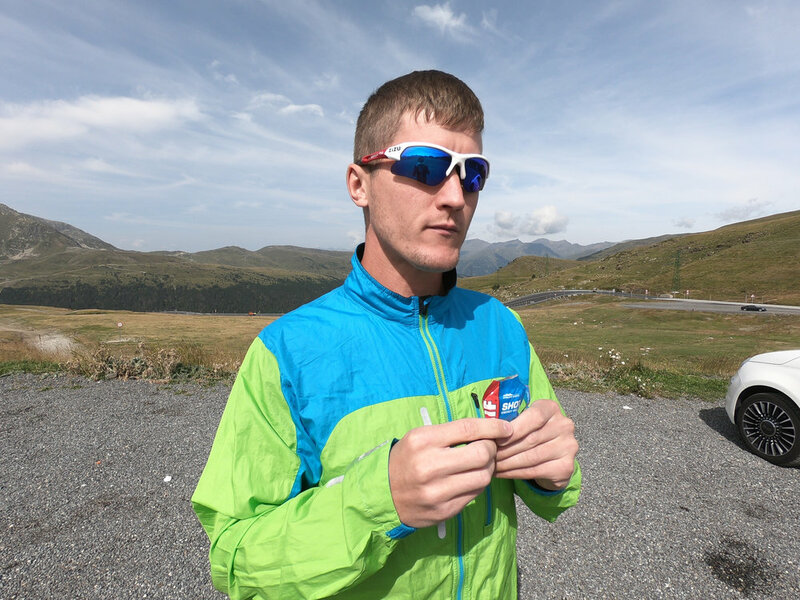 I highly recommend this running jacket to anyone who is looking for a high-quality, functional, comfortable, durable jacket to wear in cooler temperatures. You can find the Ronhill Trail Vertex running jacket at Running Room by clicking here. I personally like the Running Room located at 8537 - 109 Street in Edmonton as they have a fantastic selection of running shoes and apparel. The staff there are super friendly and they also have a back room with many discounted running shoes. I even saw last year’s model of this jacket (red colour) at the 109 Street Running Room this winter at a discounted price. I have worn the Ronhill Commuter Xero 10L + 5L Vest Pack during my daily run commute to and from work every weekday for the past month (03 Feb 2017 to 06 Feb 2017). I have run approximately 300km total with this bag. When I run to work, the contents of the pack weigh approximately 5-7 lbs (2.3-3.2 kg), which includes my lunch and spare clothing. When I run home, the pack is a lot lighter with just has a spare change of clothing inside. The purpose of this review will be to provide you with my personal observations on this particular running pack. This pack is sold in two different colour schemes: Granite/Lime and Royal Purple/Fuschia. The name of this bag is the Ronhill Commuter Xero 10L + 5L, which means that when the pack is in the smaller configuration with the perimeter zipper zipped shut (see far left column), the internal volume is 10L. When the perimeter zipper is unzipped, then the internal volume expands to give you an additional 5L for a total of 15L (see far right column). This running pack makes a lot of sense. It is very obvious to me that Ronhill has done extensive research and development on this pack and there were clearly many runners involved in the process. I feel as though Ronhill's main purpose in life is first and foremost to produce the greatest pack (or jacket or top or whatever they are making) for the end user. The fit of this pack is excellent and it hugs my body perfectly. There are numerous ways in which this pack can be adjusted to fit you just right. There are two elastic straps that go across your torso and they can slide up and down. The lower end of each shoulder strap can be adjusted to effectively shorten or lengthen each shoulder strap. You do this by pulling the lower end of the shoulder strap (located near where the glove fingertips are in the photo below) out from under the hip pockets. The elastic torso straps are a very nice touch and stretch when you inhale/exhale, which is really nice. The last running backpack I had did not have this and it was annoying to have to constantly readjust the nylon straps based on if you had a lot of gear in the pack or if you just ate a big meal. Distribution of Weight - To me, the centre of gravity is quite close to the back and rides higher up than a more traditional pack. This was my first "vest" style of backpack so it felt odd at first but I got used to it and I find it much more comfortable than a traditional pack now. The Ronhill Commuter Xero 10L + 5L Vest pack rides higher than a non-vest style backpack, which is a good thing as it doesn’t affect your arm swing at all while running. The pack wraps around your upper chest rather than your stomach like a more traditional backpack. It is very easy to breath while wearing it. It feels more like wearing a vest than wearing a backpack. The relatively wide shoulder straps really help to distribute the weight over a greater surface area, which is much more comfortable. 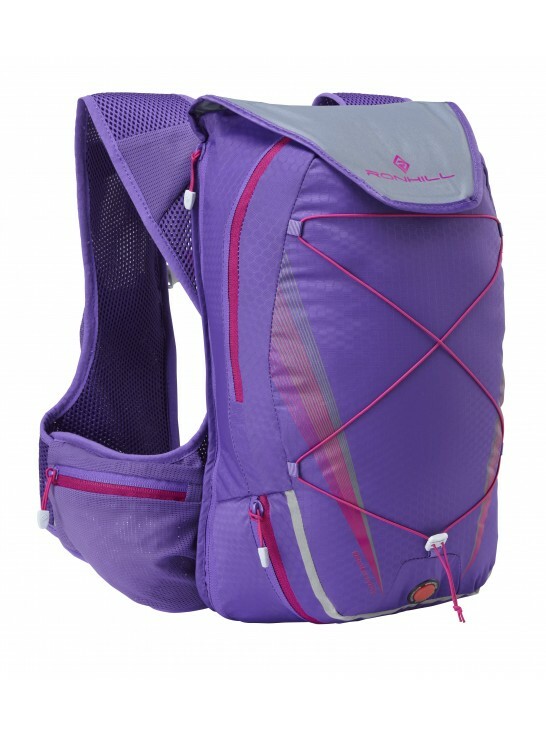 The wide shoulder straps don’t cut into your shoulders with more weight in pack. Front Pockets - Fantastic idea. They are made of a stretchy mesh material. I usually store an extra tuque (Canadian word for beanie or hat), an extra pair of gloves and a buff here. They work well and are an ample size. In the front right strap, there is also a black whistle and a smaller mesh pouch to store things such as I wallet, I believe. Size of bag – Perfect for my lunch and a spare change of clothes (underwear, socks, shirts). The 10L +5L concept is a fantastic idea and very useful/practical. I generally like to keep it as small as possible in order to keep the centre of gravity as close to my body as possible. However, when I have a larger lunch or if I am bringing my work clothes home at the end of the week, then I unzip the perimeter zipper and use the full 15L size of the bag. The perimeter zipper goes in a "U" pattern along the left side, then along the bottom, then along the right side of the pack. The additional 5L is also nice to accommodate racing flats for Tuesday tempo sessions or Friday interval sessions. There's an elastic draw cord on the back side of the pack, which cinches tight to make the pack as small as you need it and prevent items inside from bouncing about - great idea. When I'm run commuting, I find it annoying when I can hear the jingle-jangle of loose items inside the bag and having that cinch cord and perimeter zipper eliminate that, which is awesome. Details - Keepers for the front torso elastic straps are very nice to prevent the end of the straps from dangling and swinging around while you run. I also like the way in which the zipper pulls are tied to the zippers. First the zipper pull material is stiff and second the zipper pull length is just right - these two attributes allow the zipper pulls to remain relatively rigid while you are running. Again, I find it annoying when straps/zipper pulls/loose fabric/etc is flailing about while I'm running. I like my pack to be sleek, aerodynamic, and efficient - high speed low drag ;). The zipper pulls also allow you to use the zippers even with mitts on - a nice touch as many of my winter runs in Cold Lake, Alberta, Canada are done when the temperature is below -20C! Top Flap - Really good idea. I believe what this flap does is prevent water from entering the bag via the tiny opening where the two zippers come together and it also ensures that the waterproof pouch in the backside remains completely dry. A third (and possibly unintentional positive byproduct) of this flap is that it helps relieve the stress concentration on the zippers. In every bag I have ever seen, the number one thing to fail first is the zippers! The greatest stress is put on the zipper at the very top of the bag when the pack is heavily loaded. Having this flap with velcro takes part of the load, which means there is not as much stress directly on the zippers. Great durability in this bag. Lightweight - I measured this pack to be 431 grams - less than a pound empty! Even considering how lightweight it is, it is still super comfortable. Damp pocket - This makes a lot of sense and is really practical. I use it all the time when I'm bringing my sweaty running clothes and head sweatband home. The head sweatband may look funny but it prevents sweat from getting in your ears and damaging your earphones. The damp pocket helps to segregate the damp clothes from your dry clothes (and maybe work papers inside the main compartment that you might be bringing home to work on). It is located at the bottom of the bag as shown in the photo immediately below. Internal Miscellaneous Items Pouch - I put two iPod Shuffles in here (I always carry one spare Shuffle of course), my identification and some money. I like that it is sewn into the bag at the top edge only (it free hangs) because if you happen to have pointy objects inside the pouch, they don't dig into your back when you're running. I have used other running packs, with small pouches that are sewn all the way around the perimeter and sometimes this causes sharp objects to dig into your back but that's not the case with this Ronhill pack. Water Resistance - Although I have not tried this pack in the rain, I am confident based on the material of construction that it would be very resistant to moisture. Hip Pockets - I suggest that Ronhill consider moving zippered pockets forward as it can be quite challenging to reach into these pockets while running and while wearing mitts. A workaround that I have found is when I'm trying to access the right hip pocket, I push the entire pack to the right with my left hand, and that makes it a bit easier to access. Maybe my arms/shoulders are really inflexible? Another potential solution could be to change the zipper so that instead of just being a straight forward-back horizontal zipper, it was instead a forward-back horizontal zipper plus a little extra zipper that went vertical in the forward edge of the pocket (kind of like an L shape). Perhaps this might make it easier to access the contents of the hip pockets. However, I understand the design that Ronhill was going for with these hip pockets. If they were to move the hip pouches too far forward, then they would interfere with the arm swing. The location where the pouches are currently located is tucked back out of the way, which is nice. Reflective Stripes - I suggest that reflective stripes be put on the front side of the straps (not just on back side of backpack as it is currently) and possibly on the lateral (left and right) sides of the pack. This is easily mitigated by adding a simple yellow reflective belt around the pack though so it's not a major issue. Carry Loop - I'm not sure if this even warrants consideration but I found that when I am carrying the pack to the front door from the kitchen in the morning using the cord carry loop, sometimes the relatively fine cord that the carry loop is made of is uncomfortable on the fingers. Considering that this happens about 1% of the time and doesn't affect the running performance of this pack, it's not a significant concern but I thought it should be mentioned. Maybe in the future, consider making the carry loop out of a flat lace type of material to distribute the load over a bit larger area. This really is a minor issue and can easily be rectified by carrying the bag by the shoulder straps. The Ronhill Commuter Xero 10L + 5L Vest pack is an outstanding running pack and I highly recommend it. 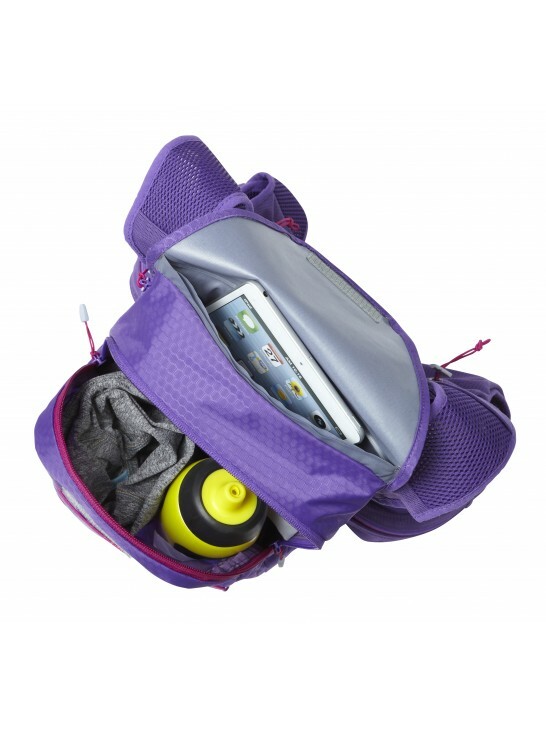 If you are looking for a pack for the run commute (or even just a pack that you could use as a gym bag), this is definitely the one I would choose. If you are interested in this pack, you can find it at Running Room.